This Latin Cruises will be held at the M.V.Queen of Diamonds if you want to buy tickets go to the section at the end of this page and select how many Tickets you wish to buy. After that you are ready to dance to the best Latin Music and Top 40’s. This 2019 we have two options regarding the FOOD selection. One is the normal Light Buffet (Cheaper) and the second one is the Full Buffet . Please just click on one of the links if you need for more information. You can also Buy Tickets in some local Stores in Vancouver. If you want to check other Latin events in the city go to Vancouver Latin Fever page and you will find all the information. The dress code is casual remember that is summer. 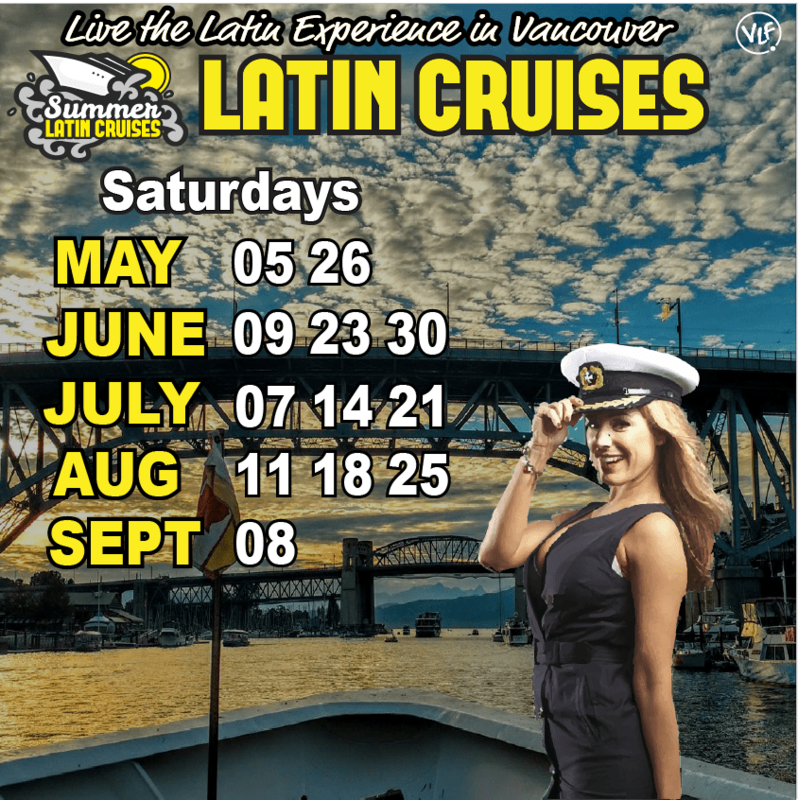 Select How many Summer Latin Cruises Aug 24 Tickets you wish to buy and probably we’ll see ya on board dancing the best Latin Music and Top 40’s and of course If You have a Big group of people (10 or more) coming to the Latin Cruises please call us 604.722.1559 (Hugo) 778.891.7644 (Jerry) of course we will take care of you. Experience The Latin Culture in a three hour cruise-ship and simply dance the night away with the best selection of music (Salsa Latin-Top 40′) in the city of Vancouver. 3 Floors with 3 Djs in addition let us guide you through the quiet waters of False Creek by glitter of Science World, or into the effervescent Inner Harbour, also don’t forget the beautiful West Van Shore line.